The 1989 pro-democracy movement in China constituted a huge challenge to the survival of the Chinese communist state, and the efforts of the Chinese Communist party to erase the memory of the massacre testify to its importance. This consisted of six weeks of massive pro-democracy demonstrations in Beijing and over 300 other cities, led by students, who in Beijing engaged in a hunger strike which drew wide public support. Their actions provoked repression from the regime, which - after internal debate - decided to suppress the movement with force, leading to a still-unknown number of deaths in Beijing and a period of heightened repression throughout the country. This book assesses the impact of the movement, and of the ensuing repression, on the political evolution of the People’s Republic of China. The book discusses what lessons the leadership learned from the events of 1989, in particular whether these events consolidated authoritarian government or facilitated its adaptation towards a new flexibility which may, in time, lead to the transformation of the regime. It also examines the impact of 1989 on the pro-democracy movement, assessing whether its change of strategy since has consolidated the movement, or if, given it success in achieving economic growth and raising living standards, it has become increasingly irrelevant. It also examines how the repression of the movement has affected the economic policy of the Party, favoring the development of large State Enterprises and provoking an impressive social polarisation. 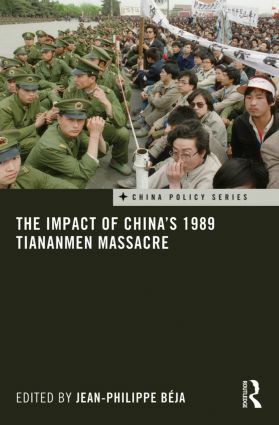 Finally, Jean-Philippe Béja discusses how the events of 1989 are remembered and have affected China’s international relations and diplomacy; how human rights, law enforcement, policing, and liberal thought have developed over two decades. Jean-Philippe Béja is a Senior Researcher at CNRS (Centre National de la Recherche Scientifique), and CERI-Sciences-Po (Centre for international Studies and Research), Paris, France. He is currently conducting research at the French Centre for Research on Contemporary China (CEFC) and Adjunct Professor at the Department of Government and Public Administration at the Chinese University of Hong Kong.